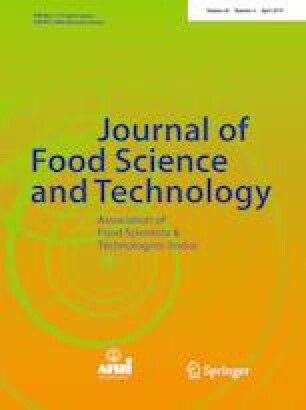 This study analyzed the characteristics (physicochemical properties as well as antioxidant activity) of corn grit extrudates containing buckwheat flour at various levels (0, 10, 20 and 30% w/w) extruded at various temperatures (130, 150 and 170 °C). Effect of roasting (92 °C for 15 min) on the extrudates was also studied. Buckwheat incorporation at different levels mainly increased the diameter, a* value (indicating redness), phenolic content and antioxidant capacity, while decreased bulk density and water absorption index of the extruded products. On the other hand, increment in extrusion temperature primarily increased the L* values (lightness), a* values and antioxidant activity but decreased the phenolic content of extrudates. Roasting improved the flavor and texture of the extrudates which was desirable. Extrudates prepared from corn grit with incorporation of buckwheat up to 20% level and extrusion cooking at 150 °C showed best sensory scores. All the authors thank financial support from DST (India) and CSIR Project No. 38(1419)/16/EMR-II.